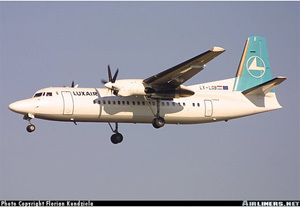 On November 6, 2002, a Fokker F27 Mk 050 turboprop-powered airplane, owned and operated by Luxair and registered as LX-LGB, departed Berlin as Flight LG 9642/LH 2420 to Luxembourg. Inadequate landing visibility was reported at the destination airport and remained throughout the approach. The crew attempted an approach, but visibility remained inadequate, and a go-around was initiated. Shortly after initiation of the go-around, ATC reported that visibility had improved to above the required minimums. The captain aborted the go-around and attempted to capture the glide slope from above. In attempting to capture the glide slope, the captain moved the power levers below the flight idle detent. Moving the power levers below the flight idle detent in flight was specifically prohibited by the Airplane Flight Manual. Upon landing gear extension, a design defect momentarily released the secondary mechanical low pitch stops and allowed the propellers on both engines to transit into the reverse pitch (beta) range. The captain recognized that reverse pitch had been attained, and moved the power levers back into the forward thrust region. However, the pitch on the right propeller continued to reduce and eventually went fully into reverse. In response to the effects of increased drag, loss of lift, and thrust asymmetry, the captain chose to shut down both engines in an attempt to maintain control. After shutdown, the left propeller feathered, but the right propeller remained in full reverse. The airplane touched down near the edge of a highway 3.5 km short of the runway, bounced over the highway, broke up, and caught fire. Of the 19 passengers and three crew members on board, only the captain and one passenger survived.